I couldn't make up my mind what I wanted to eat so I decided to just drive toward my default local Zankou in Glendale. On my way over, I noticed this ARKO market right next door to Zankou, so I decided to poke my head in there right quick. Turns out to be a Filipino market. They also have prepared foods as well with a long line of Filipinos. I took a number and waited it out. 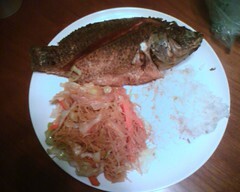 I got a fried fish, pancit noodles, and rice. The food is not made to order so your mileage will vary depending on how long the food sat out for. But judging by the long lines at the prepared food area and the busy marketplace, this appears to be a hot spot for Filipino eats. Will check out some more stuff there sometime. By the way, Famima!! opened its 7th location in the Los Angeles area on Colorado on September 13, 2006. Saturday was the Eagle Rock Music Festival. Colorado Blvd is closed off to car traffic, multiple stages are set up for a bunch of bands, all the businesses are open late into the night and the whole community comes out to enjoy the music and food. Unfortunately, I totally missed it. I was at the LA Weekly Detour Music festival in Downtown Los Angeles. 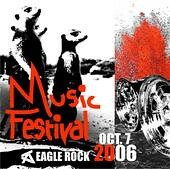 I had bought the Detour tickets before I knew the dates of the Eagle Rock Music Festival. Hopefully, next year the two events won't happen on the same date.